Please click on a category to view sub categories. White Buffalo has collected Intricate Silverwork by many FAMOUS Artists, including Alvin Yellowhorse , Ernest Benally , Zuni Artist; Effie C (Calavaza), Tommy Singer, Sam Gray, and Tommy Moore just to name a few. 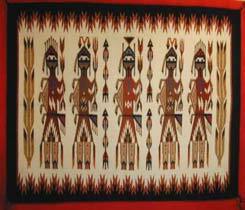 Fetishes (Zuni, Isleta & Navajo). Fetish collecting is addicting ! 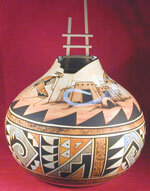 We have many to chose from including Zuni, Isleta & Navajo. 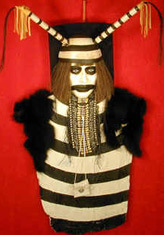 A Fetish is an animal carving usually made of shell or stone and said to house the supernatural qualities of that animal. Our collection includes Ute, Acoma, Jemez, Santa Clara Style, Horse Hair, Reverse Horse Hair, Laguna, Hopi, Zuni and Navajo pottery. Native American Artifacts, Weapons, Quivers, Bow & Arrows, War Clubs, Shields, Knives, Cradleboards, Sculptures, Paintings and much more. Famous Creek Artist, LaNeAyo has created some beautiful " life like" Masks and Weapons. This section has Hopi Shalakos, Katsinas, Rattles and Baskets by our favorite Hopi artist's like Dalawepi, Edwin Choyou Jr., Torivis, Cimmaron Grover, Alton Pashano, Milton Howard, Buddy Tubinaghtewa, Lee Sockyma, Johnny Wester and Loretta Silas. Here you will find some of the BEAUTIFUL Native American bead work that we found. 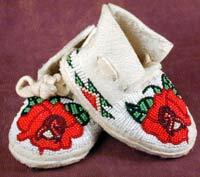 These beaded pieces are done by Artist such as Lila A. Jones, Eva B. McAdams and Heather Sun-Rhodes. 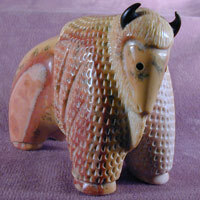 This section includes hand carved wood plaques from the Northwest region and the Quinault tribe. You will also find baskets woven by Quinault women like Leta Shale, Maggie Kelly and Nellie Williams. In our travels we have found some beautiful art work that is NOT authentic Native American pieces but have been created in the Native American Spirit. New Arrivals and Monthly Sales. Here we will list our newly arrived items (NEW ONES COMING SOON!) and our monthly sales.